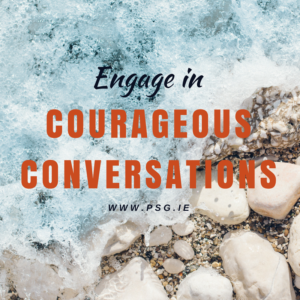 A Courageous Conversation, When Was Your Last One? You are here: Home » Blog » A Courageous Conversation, When Was Your Last One? Courage is an interesting word, one that can send your heart racing or a comforting word allowing you to be your whole beautiful self. Conversations – we have these every day, some are had over a cup of coffee, others are had in a more structured way to achieve a necessary outcome. Put the two words together – Courageous Conversations – and you have something very special! I often hear from the clients I work with how much effort goes in to preparing for taking the first step, to decide where and when to have that courageous conversation and dealing with the uncertainty of how they will manage being uncomfortable, will they be okay and will the other person be okay, what will I do if it doesn’t go well and damage is done to the relationship, damage that cannot be repaired, what then? Sound familiar? If it does, then perhaps it comes with a feeling of being stuck – of being too frozen to take the first step. So what do you do when these stories show up to take space in your head and make you hesitate before you take action to have the conversation? Do you dilute the message, come up with a really good excuse to get out of the black hole you are in, come up with a strategy to say what you want to say in a roundabout fashion and hope the other person will know what you really want to say? Some or all of these actions show up in our day to day conversations and so we hold ourselves back from making them truly courageous. And I am not speaking about big deep meaningful discussions, perhaps it is the conversation where you are asked to do something and you feel obligated to say ‘yes’ . Then you have to explain why you said yes because you have just said ‘no’ to the really important things in your life. It takes courage and practice to break the habit to immediately say ‘yes’ when you would love to say ‘no’, to break the habit of always automatically putting others before yourself, to never quite feeling like you have been considered. The courageous conversation often starts with having an honest check in with ourselves and what we need to be doing to take care of ourselves first and then those closest to us. Start with the small courageous conversations with action and as they gather momentum, the bigger ones will take care of themselves with just a little more effort, which enables us to live bravely with a little more ease while being the very best version of ourselves. Where do you need to have your honest and courageous conversation?